For sixty-five years, the Great Books Foundation has provided opportunities for readers of all ages to pursue learning through discussing written works and ideas of enduring value. The adult education division of the Foundation supports a network of self-directed discussion groups, produces anthologies of literature, provides workshops in the Shared Inquiry™ discussion method, works with colleges interested in discussion-based learning, hosts Great Books Chicago and other events, advances initiatives such as Great Books groups in prisons, and collaborates with other organizations for special projects. We have decided to bring this wide array of activities under a single new name, Great Books Discussions. We think this name captures the essence of all that we stand for and all that we know you value: the reading of outstanding literature and the rewards of discussing the ideas that this literature embodies. 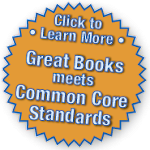 Great Books Discussions is here to serve your needs and interests, and we welcome hearing from you. It is your commitment to the discussion of enduring books and ideas that keeps the Great Books community vital. Don, I think this is a great idea - keep up the good work, and we look forward to having you join us at Classical Pursuits in Toronto this summer! I eschew the rapid-fire sound-bite environment of most social media but welcome this undertaking by GBF. Opportunities for thoughtful conversation about the enduring ideas raised by great books are not easily available to many. The challenge will be to persuade older folks like me that there is great value to be found here at the screen.